A reflection on Christ the King Sunday, especially for year B of the Revised Common Lectionary. 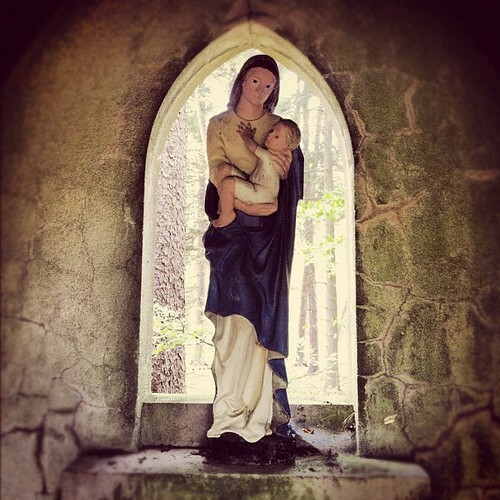 A wayside shrine at the Convent of St. John Baptist in Mendham. Photo by Rick Morley. Pope Pius XI inaugurated Christ the King Sunday in 1925, when the authority of the church was evidently waning in the world. Of course nearly ninety years later, the “authority” of the church—or even just the “place” of the church—in the world is almost laughable. We are all but irrelevant in the power structures of the community of nations. Whatever the original intent and motive of Christ the King Sunday, one can easily see “Christendom” making one last effort—only last death-throw gasp—to stem the tide, and regain a position of power and influence in the world. But, it does do one well to consider the kind of kingship that Jesus represents. Jesus of Nazareth didn’t reign from a position of political and military strength. I don’t like to get to Christmas until…you know…it’s actually Christmas. But, for several weeks now the lectionary has already begun it’s move to the coming of Christ (second coming, then first coming), and it’s useful to look in the direction that we’re going. And, Jesus, when he came in Bethlehem, came as a vulnerable infant. Not a conquering warrior. No throne. No crown. No sword. No scepter. His trappings were swaddling cloths. In fact, the incarnational movement of God—especially in the Gospel of John—is in the giving of Christ to the world. (For God so loved the world that he have His only son…) God handed His only son over to us. An act of great vulnerability. And, of course, the culmination of this giving of Jesus to us, was us crucifying him. Naked. Beaten. Broken. Laughed at. Spit upon. Nailed. Hastily laid in a borrowed tomb. Jesus was given in an act of vulnerability, he came vulnerable in manger-mild, and he was killed in the great act of willing vulnerability. This is important, and inextricably bound to his Kingship. This is the kind of king that Jesus was, and is. My kingdom is not from this world. If my kingdom were from this world, my followers would be fighting to keep me from being handed over to the Jews. My kingdom is not from this world, and therefore no one is fighting for me. Because in my kingdom we don’t do that. And, even in the consummate vision of John in Revelation—even in victory over the forces of darkness and evil, Christ is still the lamb at the center of the throne. Still the sacrificial lamb. What does this mean for us, the followers of this vulnerable king? It means that we’re to follow in His footsteps, embracing rather than denying, our position of vulnerability. And, let’s face it, we are powerless. Powerless to stop the push of water into New York harbor. Powerless to stop great trees from being split in two, destroying homes, livelihoods and power lines. Powerless to prop up failing economies. Powerless to raise perfect children, have the perfect home, attain the perfect job, and minister in the perfect church. Powerless to impress all the neighbors, and assuage our own guilt and shame. Powerless to change the past—things done to us, and things done by us. Powerless to stop death from taking us or our loved ones to the grave. And boy does that tick us off. Nothing makes us angrier than being powerless. Nothing makes us want to point the finger of blame like being found out to be powerless. Nothing makes us sink into a pool of despair and denial than powerlessness. Nothing makes us want to launch a missile and start a war like the reality of our vulnerability staring us in the face. But, if we can follow our Great King, who embraced powerlessness in the manger and on the cross…great things can happen. No army has ever defeated the power of darkness and evil. No bomb has ever staved the power of death. But…a bloody, beaten, and naked Christ did. I appreciate the change given me to read such interesting topic, since I´m entitle to bring the reflexion in my church on Sunday the 3er of November; am not a preacher, but someone struggling to understand more and more these special topic in the lfe of our church. Thank you and may God bless you!